Single & Twin Pipe Line Adapters manufactured by us are mainly used for distributing oxygen from one outlet to one, two or more patients. These are made according to the quality standards and under the guidance of our experts. These are fabricated using premium quality materials and are available at affordable prices in the market. These products are widely used in various applications in medical and pharmaceutical industries. 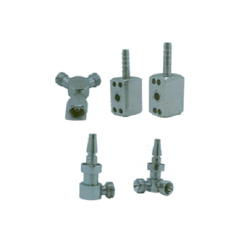 Looking for Medical Gas Pipeline Adapters ?